Review of Petrus Aged Pale Grand Reserve | Beer Apprentice - Craft Beer News, Reviews, Interviews and Info. For today’s craft beer review I thought I would try a Petrus Aged Pale Grand Reserve produced by Brouwerij Bavik located in Harelbeke-Bavikhove, Belgium. I have never had a beer from this brewery and I don’t have much experience when it comes to Sours, so this could be a double whammy if I’m not careful. Let’s see what we can find out about it from the brewer’s website, bavik.com. Our Petrus Aged Pale is an undiluted old beer. Well, that didn’t tell me much. Let’s just get it in the glass and find out for ourselves. This beer comes in a 25.4 oz. bottle and has an ABV of 7.3%. The brew poured a very clear, deep dark honey to dark orange color with an eggshell colored head. The crown was tight, mostly creamy and of average size. It had decent retention and left behind some very good lacing when swirled. The cap finally settled to a silky film, then to a fine ring around the top. A very nice stream of carbonation bubbles were racing to the top, which created an even more pleasant appearance. The aroma conjured up characteristics of soured white grapes, lemon citrus and green apples. Some of that “barnyard funk” was easily noticed, but it wasn’t quite as overpowering as some that follow this style can be. Some “woodiness” and “oak” hid underneath the sourness and fruit to add a touch more complexity and balance. The first sip is a palate shocking sourness, but by the 2nd or 3rd, my taste buds had acclimated enough to distinguish some green apples and lemon peel. This taste sort of reminded me of a White wine. Very similar in that I found more of the sour grapes along with a slight vinegar redolence. More of the “oak” and “wood” was found in the taste too. It was subtle, but there. The overall savor was tart and bitter, however I got used to it in a hurry, thus making for an excellent and well rounded taste. The mouthfeel was medium, very dry, sharp, bite”y” and crisp. A wonderful wave of flavor sat right on my tongue and quite a bit more was clinging to my lips and the roof of my mouth. A very nice mouthfeel with this one. Well, like I said in the beginning. I don’t have a whole lot of experience drinking Sours, however I really liked this one. 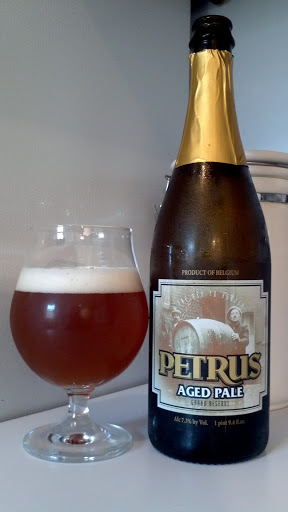 The Petrus Aged Pale Grand Reserve may tempt me to give Sours another serious look. The aroma and taste were both very pungent (in a good way), the appearance was very nice and the mouthfeel was awesome. I definitely think that I would pick this up again. It’s not a beer that has a high drinkability, however I could see myself sipping on one during a late Summers’ afternoon. Give it a go if you have not had it and let me know what you thought of it. Do any of you guys like Sours? If so, what’s are some of your favorites? I’m very interested in finding a few more to try. Surprused you enjoyed that as much as you did and impressed you're going back for more. I'll have to find a good sour and re-introduce them to my palate. I was surprised too!!! It took a sip or two to get used to it, but once I did, it became very nice and enjoyable. I want to find a couple more for sure.